The 70 year old legendary singer announced at a press conference this morning that following his ‘Farewell Yellow Brick Road’ tour he will stop from touring altogether. The farewell tour is expected to run three years with 300 dates so John will not officially begin his retirement until 2021. This comes from a rather tearful press conference where virtual reality headsets where handed out before the announcement, showcasing John’s entire career in five minutes. Many great artists such as Cher, Kiss and Ozzy Osbourne have announced farewell tours, only to come out of retirement just a couple of years later. Elton John, however, insists that this is definitely real. Rolling Stone reports John said, “I’m not Cher. I can’t physically do the traveling anymore. I want to be at home. I really want to spend time with my children at home. I’ve had an incredible life, but life is all about change.” The beloved artist will continue to be creative, he assures. He will still write and record music. John’s main reason for retiring from touring circles his children, family and friends. He said, “My priorities have changed. I have young children,” and followed with, “I haven’t had much time off in my life. I definitely want to make a couple more albums, but that will be easy since I can do that at home. I want to see friends. I want to spend time at my house and with my photography collection. 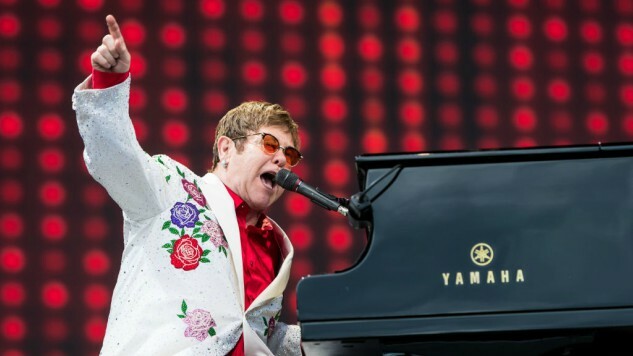 I’m really looking forward to this tour and I’m really looking forward to the 300th date.” John promises this final tour will be the most fantastic show he’s ever done, and it will be the biggest and best way to finish his touring career. The tour will begin on Sept. 8 in Allentown, Pennsylvania. This is not the first time John has issued a statement announcing an end from touring. In 1977 he made the same decision to a very surprised London crowd, however that was clearly short lived. For the past 20 years, John has averaged slightly more than 133 shows a year, balancing between his more permanent residence at Caesar’s Palace in Las Vegas and stadiums around the rest of the world. John first suggested he would be slowing down three years ago in order to spend more time with his family. He told Rolling Stone at the time that his family is his top priority and that he has to be there for when his children are in school. His children Zachary and Elijah are seven and five respectively, and he is married to manager David Furnish. The singer is about to celebrate his 71st birthday this March.